Glad you two like them. Say hi to Sidekick for me! Brandi! Wow!! I love them all. Decision, decisions-- I might have to switch a few times before Halloween. I got the pic off a mystery site. I think it was a cover. I couldn't find it again so I had to save my pic to an email so I could use it again if my computer crashed or something. I am so glad you like them, and I think it is a cool idea to switch them around. You might consider opening a FREE photobucket account to keep it in. They are easy to set up and free, and you can link avatars and many other images from your account to here! Sometimes I see something that makes me think, "This is a great idea for a certain monkey", then I make it and store it until the right time. Hope Josef's stomach stays better. So many to choose from...what is a monkey to do....thank you so much!! Me too, but only when no one is watching! I wanted to thank you again for my lovely avatar pics. You did such a wonderful job with Koda. I was curious if you have a larger one of him like the one I am using? He just looks so impressive in that picture. Ooooohhhh, lookie at all the wonderful Halloween avatars I found!! Brandi, thank you so very much! Great job! I figured you wanted Koda's head larger with the same background, so I made some for you. Each design has a blinking and not blinking version. And while I had all your files out working on those for you, I put together a couple for Halloween designs in case you are interested in using them! If this is not what you wanted, just let me know and I'll rework it for you! Leave me a post and let me know! Hi Brandi! Can you make me a Halloween Avatar from this? I bake a lot, have 9 grandkids(which has aged me faster than my chronological age)...and I love this monkey! (more than the current one). You are awesome! If I didn't copy the link correctly...let me know. 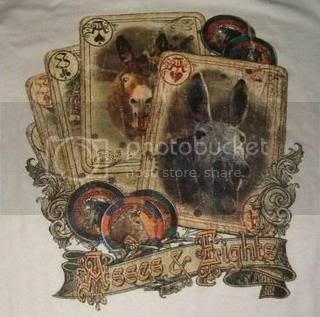 This is a picture of my new t-shirt Asses and Eights. Alas, I cannot see the image you pointed to. I'll be happy to make you a Halloween avatar. As soon as I can see what you want me to make it with! Love the image on the shirt! Glad you had a good day with your sis! I thought the shirts said 'asses and higher'. Wow Thanks Brandi this is great. If you could meet him you would no doubt love him. He is 350lbs of pure love. Well maybe 400lbs. It's been a good summer for him. Right now he is a Chunky Monkey. Next spring he will go to a trainer for a few months and will be very much muscles and focus when he comes home. He will then start his career of giving people rides in the cart and hopefully small children "not over 50lbs" in the saddle. I love this avatar for Halloween. I might switch back and forth once in awhile. Could we minimalize Haleigh's avatar, please? I would like to download Haleigh in the "signature spot". What do you think? Page created in 5.884 seconds with 19 queries.